Back in March of 2009 I broke news about the possibility of a cordless Dremel Multi-Max after coming across a concept rendering of said tool. In May of this year my local tool store let the cat out of the bag about the 12-volt Dremel Multi-Max, with a release date of October. This news pretty much guaranteed that the Multi-Max was indeed true. Now I have the press release from Dremel that makes the whole thing a reality. It is official. The cordless Multi-Max runs off of a 12-volt lithium-ion battery, with a variable speed range from 3,000 – 21,000 oscillations per minute. It takes many of its styling and functions from the corded version, including separate variable speed and on/off controls. 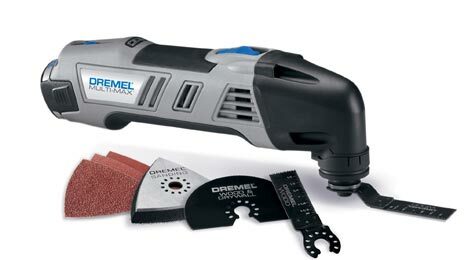 The cordless Dremel Multi-Max is compatible with all Dremel oscillating accessories and attachments. The 8300-01 cordless Multi-Max kit features two 12-volt lithium-lon batteries, a one hour charger, deluxe storage case and seven Dremel oscillating tool accessories, at starting price of $149.99.